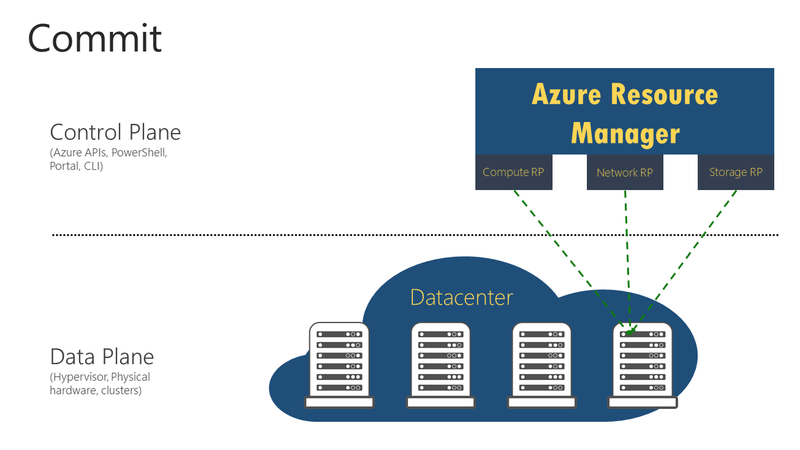 Let's take a deep-dive on migrating from the Azure classic deployment model to the Azure Resource Manager deployment model. We look at resources at a resource and feature level to help you understand how the Azure platform migrates resources between the two deployment models. 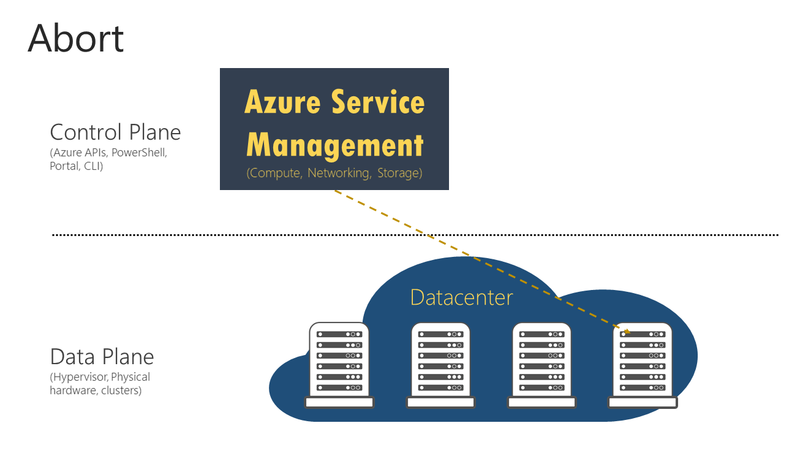 For more information, please read the service announcement article: Platform-supported migration of IaaS resources from classic to Azure Resource Manager. First, it's important to understand the difference between data-plane and management-plane operations on the infrastructure as a service (IaaS) resources. Management/control plane describes the calls that come into the management/control plane or the API for modifying resources. For example, operations like creating a VM, restarting a VM, and updating a virtual network with a new subnet manage the running resources. They don't directly affect connecting to the VMs. Data plane (application) describes the runtime of the application itself, and involves interaction with instances that don’t go through the Azure API. For example, accessing your website, or pulling data from a running SQL Server instance or a MongoDB server, are data plane or application interactions. Other examples include copying a blob from a storage account, and accessing a public IP address to use Remote Desktop Protocol (RDP) or Secure Shell (SSH) into the virtual machine. These operations keep the application running across compute, networking, and storage. The data plane is the same between the classic deployment model and Resource Manager stacks. The difference is that during the migration process, Microsoft translates the representation of the resources from the classic deployment model to that in the Resource Manager stack. As a result, you need to use new tools, APIs, and SDKs to manage your resources in the Resource Manager stack. In some migration scenarios, the Azure platform stops, deallocates, and restarts your virtual machines. This causes a brief data-plane downtime. Ensure that the resources that you want to migrate don't use any unsupported features or configurations. Usually the platform detects these issues and generates an error. If you have VMs that are not in a virtual network, they are stopped and deallocated as part of the prepare operation. If you don't want to lose the public IP address, consider reserving the IP address before triggering the prepare operation. If the VMs are in a virtual network, they are not stopped and deallocated. Plan your migration during non-business hours to accommodate for any unexpected failures that might happen during migration. Download the current configuration of your VMs by using PowerShell, command-line interface (CLI) commands, or REST APIs to make it easier for validation after the prepare step is complete. Update your automation and operationalization scripts to handle the Resource Manager deployment model, before you start the migration. You can optionally do GET operations when the resources are in the prepared state. Evaluate the Role-Based Access Control (RBAC) policies that are configured on the IaaS resources in the classic deployment model, and plan for after the migration is complete. The operations described in the following sections are all idempotent. 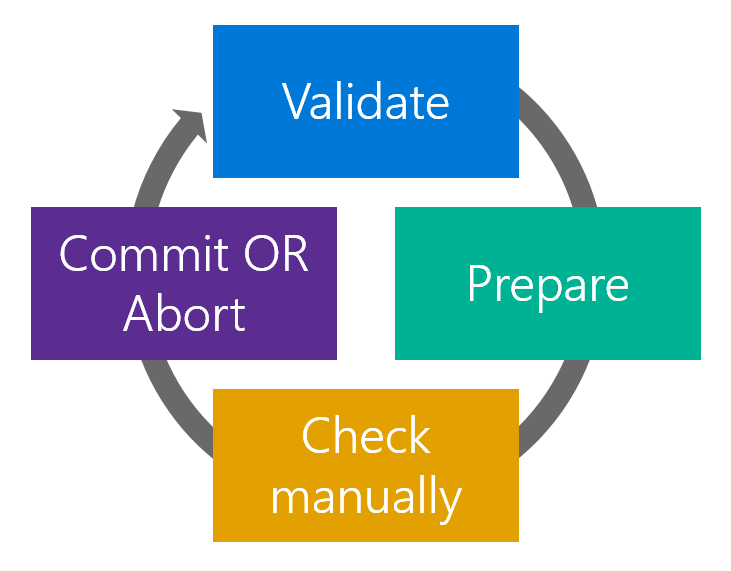 If you have a problem other than an unsupported feature or a configuration error, retry the prepare, abort, or commit operation. Azure tries the action again. The validate operation is the first step in the migration process. The goal of this step is to analyze the state of the resources you want to migrate in the classic deployment model. The operation evaluates whether the resources are capable of migration (success or failure). You select the virtual network or a cloud service (if it’s not in a virtual network) that you want to validate for migration. 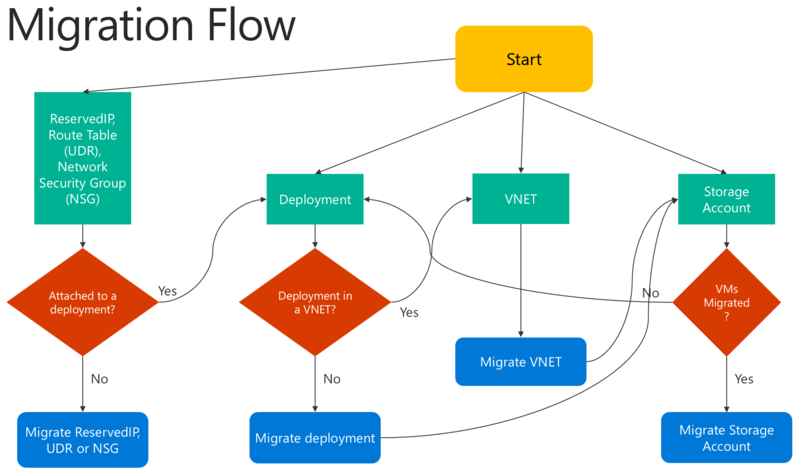 If the resource is not capable of migration, Azure lists the reasons why. A virtual network having both ER and VPN gateways. A virtual network gateway connection in a disconnected state. 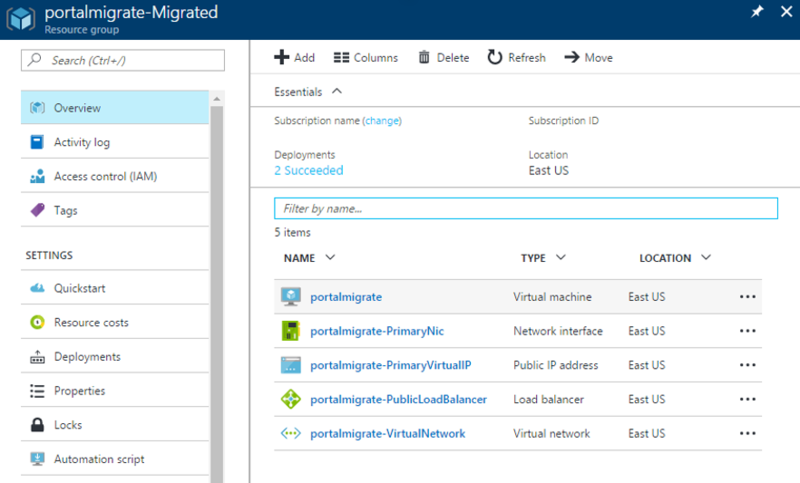 All ER circuits are pre-migrated to Azure Resource Manager stack. Azure Resource Manager quota checks for networking resources. For example: static public IP, dynamic public IPs, load balancer, network security groups, route tables, and network interfaces. All load balancer rules are valid across deployment and the virtual network. Conflicting private IPs between stop-deallocated VMs in the same virtual network. The prepare operation is the second step in the migration process. The goal of this step is to simulate the transformation of the IaaS resources from the classic deployment model to Resource Manager resources. Further, the prepare operation presents this side-by-side for you to visualize. Your resources in the classic deployment model are not modified during this step. It's a safe step to run if you're trying out migration. You select the virtual network or the cloud service (if it’s not a virtual network) that you want to prepare for migration. If the resource is not capable of migration, Azure stops the migration process and lists the reason why the prepare operation failed. 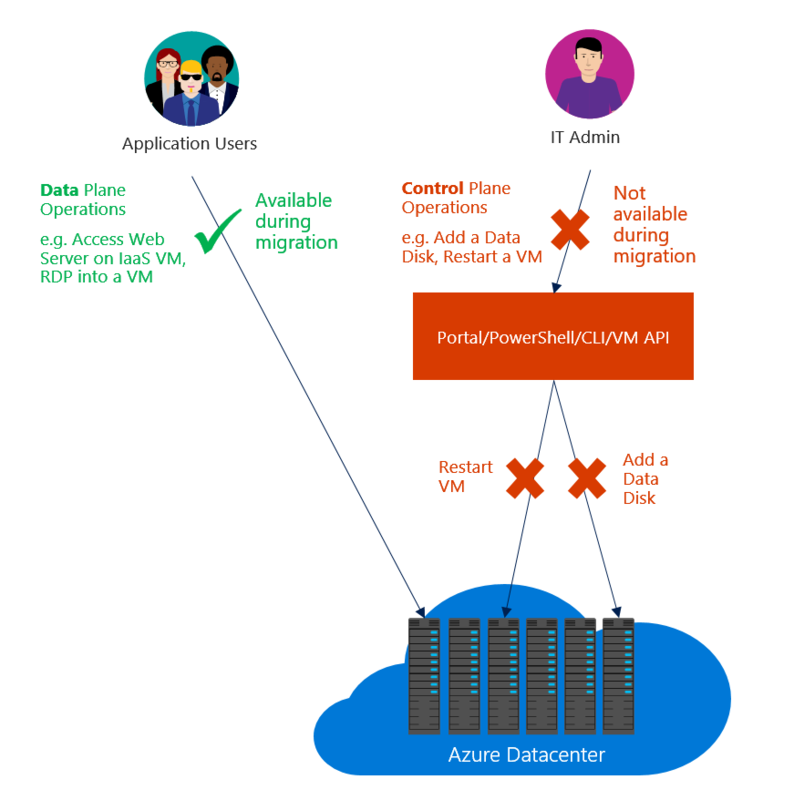 If the resource is capable of migration, Azure locks down the management-plane operations for the resources under migration. For example, you are not able to add a data disk to a VM under migration. Azure then starts the migration of metadata from the classic deployment model to Resource Manager for the migrating resources. After the prepare operation is complete, you have the option of visualizing the resources in both the classic deployment model and Resource Manager. 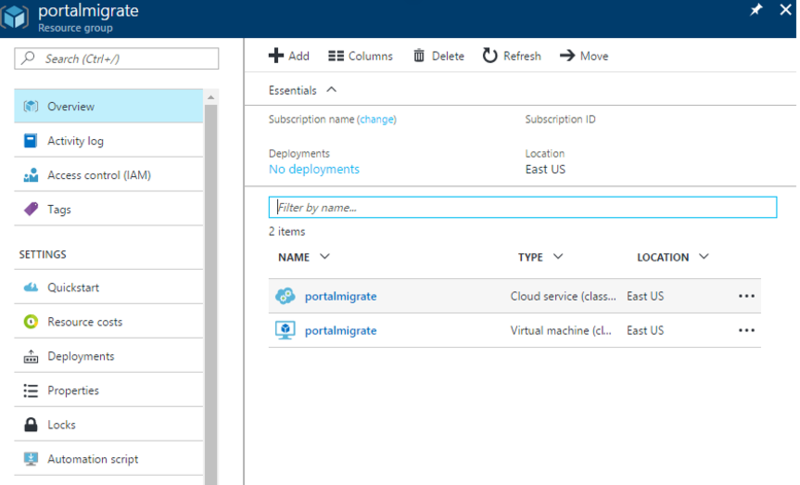 For every cloud service in the classic deployment model, the Azure platform creates a resource group name that has the pattern cloud-service-name>-Migrated. It is not possible to select the name of a resource group created for migrated resources (that is, "-Migrated"). After migration is complete, however, you can use the move feature of Azure Resource Manager to move resources to any resource group you want. For more information, see Move resources to new resource group or subscription. The following two screenshots show the result after a successful prepare operation. The first one shows a resource group that contains the original cloud service. The second one shows the new "-Migrated" resource group that contains the equivalent Azure Resource Manager resources. Here is a behind-the-scenes look at your resources after the completion of the prepare phase. Note that the resource in the data plane is the same. It's represented in both the management plane (classic deployment model) and the control plane (Resource Manager). VMs that are not in a virtual network in the classic deployment model are stopped and deallocated in this phase of migration. In the check step, you have the option to use the configuration that you downloaded earlier to validate that the migration looks correct. Alternatively, you can sign in to the portal, and spot check the properties and resources to validate that metadata migration looks good. If you are migrating a virtual network, most configuration of virtual machines is not restarted. For applications on those VMs, you can validate that the application is still running. You can test your monitoring and operational scripts to see if the VMs are working as expected, and if your updated scripts work correctly. Only GET operations are supported when the resources are in the prepared state. There is no set window of time before which you need to commit the migration. You can take as much time as you want in this state. However, the management plane is locked for these resources until you either abort or commit. If you see any issues, you can always abort the migration and go back to the classic deployment model. 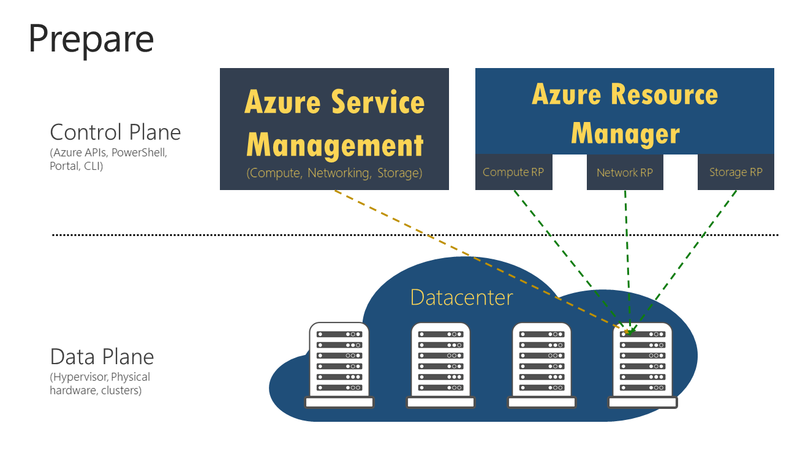 After you go back, Azure opens the management-plane operations on the resources, so that you can resume normal operations on those VMs in the classic deployment model. This is an optional step if you want to revert your changes to the classic deployment model and stop the migration. This operation deletes the Resource Manager metadata (created in the prepare step) for your resources. This operation can't be done after you have triggered the commit operation. After you finish the validation, you can commit the migration. Resources do not appear anymore in the classic deployment model, and are available only in the Resource Manager deployment model. The migrated resources can be managed only in the new portal. This is an idempotent operation. If it fails, retry the operation. If it continues to fail, create a support ticket or create a forum post with a "ClassicIaaSMigration" tag on our VM forum. You can find the classic deployment model and Resource Manager representations of the resources in the following table. Other features and resources are not currently supported. Cloud service name DNS name During migration, a new resource group is created for every cloud service with the naming pattern <cloudservicename>-migrated. This resource group contains all your resources. The cloud service name becomes a DNS name that is associated with the public IP address. Virtual machine Virtual machine VM-specific properties are migrated unchanged. Certain osProfile information, like computer name, is not stored in the classic deployment model, and remains empty after migration. Disk resources attached to VM Implicit disks attached to VM Disks are not modeled as top-level resources in the Resource Manager deployment model. They are migrated as implicit disks under the VM. Only disks that are attached to a VM are currently supported. Resource Manager VMs can now use storage accounts in the classic deployment model, which allows the disks to be easily migrated without any updates. VM extensions VM extensions All the resource extensions, except XML extensions, are migrated from the classic deployment model. Virtual machine certificates Certificates in Azure Key Vault If a cloud service contains service certificates, the migration creates a new Azure key vault per cloud service, and moves the certificates into the key vault. The VMs are updated to reference the certificates from the key vault. Do not delete the key vault. This can cause the VM to go into a failed state. WinRM configuration WinRM configuration under osProfile Windows Remote Management configuration is moved unchanged, as part of the migration. Availability-set property Availability-set resource Availability-set specification is a property on the VM in the classic deployment model. Availability sets become a top-level resource as part of the migration. The following configurations are not supported: multiple availability sets per cloud service, or one or more availability sets along with VMs that are not in any availability set in a cloud service. Network configuration on a VM Primary network interface Network configuration on a VM is represented as the primary network interface resource after migration. For VMs that are not in a virtual network, the internal IP address changes during migration. Multiple network interfaces on a VM Network interfaces If a VM has multiple network interfaces associated with it, each network interface becomes a top-level resource as part of the migration, along with all the properties. Load-balanced endpoint set Load balancer In the classic deployment model, the platform assigned an implicit load balancer for every cloud service. During migration, a new load-balancer resource is created, and the load-balancing endpoint set becomes load-balancer rules. Inbound NAT rules Inbound NAT rules Input endpoints defined on the VM are converted to inbound network address translation rules under the load balancer during the migration. VIP address Public IP address with DNS name The virtual IP address becomes a public IP address, and is associated with the load balancer. A virtual IP can only be migrated if there is an input endpoint assigned to it. Virtual network Virtual network The virtual network is migrated, with all its properties, to the Resource Manager deployment model. A new resource group is created with the name -migrated. Reserved IPs Public IP address with static allocation method Reserved IPs associated with the load balancer are migrated, along with the migration of the cloud service or the virtual machine. Unassociated reserved IP migration is not currently supported. Public IP address per VM Public IP address with dynamic allocation method The public IP address associated with the VM is converted as a public IP address resource, with the allocation method set to static. NSGs NSGs Network security groups associated with a subnet are cloned as part of the migration to the Resource Manager deployment model. The NSG in the classic deployment model is not removed during the migration. However, the management-plane operations for the NSG are blocked when the migration is in progress. DNS servers DNS servers DNS servers associated with a virtual network or the VM are migrated as part of the corresponding resource migration, along with all the properties. UDRs UDRs User-defined routes associated with a subnet are cloned as part of the migration to the Resource Manager deployment model. The UDR in the classic deployment model is not removed during the migration. The management-plane operations for the UDR are blocked when the migration is in progress. IP forwarding property on a VM's network configuration IP forwarding property on the NIC The IP forwarding property on a VM is converted to a property on the network interface during the migration. Load balancer with multiple IPs Load balancer with multiple public IP resources Every public IP associated with the load balancer is converted to a public IP resource, and associated with the load balancer after migration. Internal DNS names on the VM Internal DNS names on the NIC During migration, the internal DNS suffixes for the VMs are migrated to a read-only property named “InternalDomainNameSuffix” on the NIC. The suffix remains unchanged after migration, and VM resolution should continue to work as previously. Virtual network gateway Virtual network gateway Virtual network gateway properties are migrated unchanged. The VIP associated with the gateway does not change either. Local network site Local network gateway Local network site properties are migrated unchanged to a new resource called a local network gateway. This represents on-premises address prefixes and the remote gateway IP. Connections references Connection Connectivity references between the gateway and the local network site in network configuration is represented by a new resource called Connection. All properties of connectivity reference in network configuration files are copied unchanged to the Connection resource. Connectivity between virtual networks in the classic deployment model is achieved by creating two IPsec tunnels to local network sites representing the virtual networks. This is transformed to the virtual-network-to-virtual-network connection type in the Resource Manager model, without requiring local network gateways. As part of migrating your resources from the classic deployment model to the Resource Manager deployment model, you must update your existing automation or tooling to ensure that it continues to work after the migration.